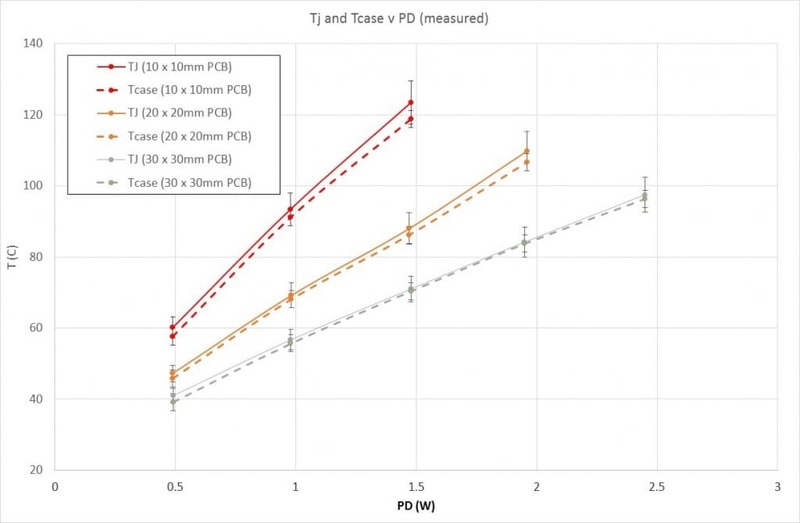 In Figures 1 and 2 of my November 2015 post I demonstrated how (for a fixed PD) the Tj of an LFPAK56 MOSFET under steady-state conditions depends to a large extent on the area of PCB copper to which the device is soldered. This was shown in simulation and verified by real-life experiment. The results from that earlier post are reproduced in Figure 1 below, for your convenience. and Tamb in this case is 20°C. 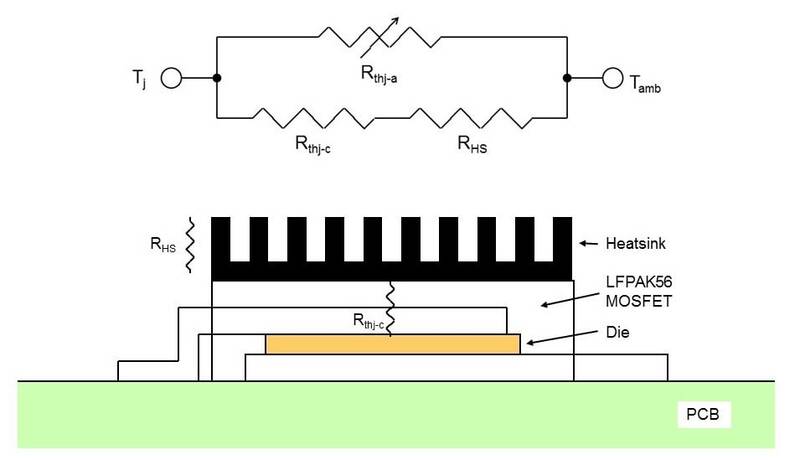 As we saw in an earlier post, for a surface-mount device using its own PCB as a heatsink, the majority of the die heat energy travels downwards into the PCB and then to ambient from the surface of the PCB. This is what I have tried to show in Figure 3. I also have shown the equivalent thermal resistance Rthj-a representing the aggregate of these paths. Rthj-a is shown as a variable resistor because its value in any situation will depend on many factors – not the least of which being PCB copper area, as we have just seen in Figure 2. Let’s assume now that we’d like to add some more heatsinking to our MOSFET. Is there another way in which we could assist the die thermal energy in its passage towards ambient? Would it help, for instance, if we put a heatsink on top of our device? If we know the thermal resistance through the top of the device (Rthj-c), and the thermal resistance of the heatsink (RHS) could we combine these numbers with the Rthj-a numbers in Figure 2 to give us an improved thermal network as shown in Figure 4? Figure 4 Adding a heatsink to the top of the LFPAK56 device, and its new thermal network. Well it so happens that our helpful MOSFET supplier has given us a figure for Rthj-c of 34K/W, and the manufacturer of a small finned 12 x 12mm heatsink is quoting an RHS figure of 25K/W. We also have the Rthj-a figures for several sizes of PCB copper in Figure 2, so that’s everything we need, isn’t it? Can we now estimate a new overall thermal resistance curve for the system of Figure 4 using simple series/parallel combinations of resistors? And how would that compare to the original curve of Figure 2? Interestingly, the answer turns out to be… Oh. Oh dear. I appear to have run out of space again. So, on that cliffhanger I’ll leave you for this month. 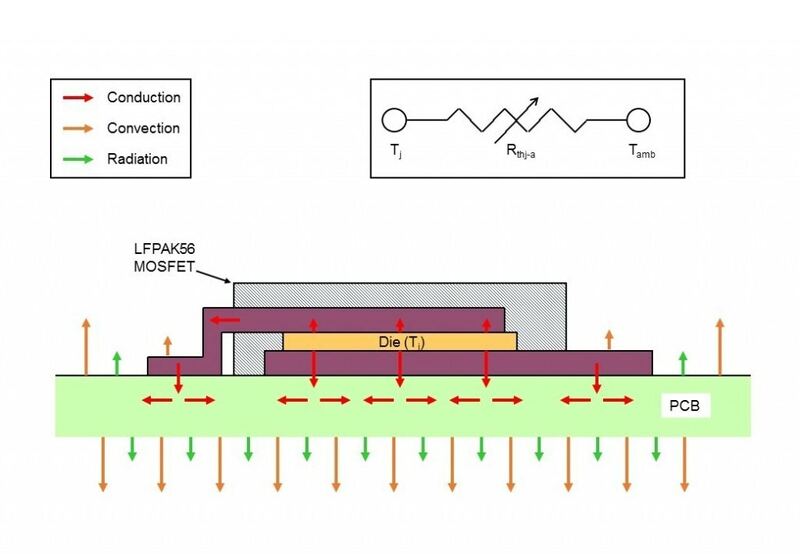 If you’d like to have a go at estimating the new thermal resistance curve for the MOSFET plus heatsink, please feel free – I promise I have given you all the information you need!